The language of protest is one that you may not be all too familiar with, yet it is one which is becoming increasingly prominent in modern day society. It is evident that the power of the media in its coverage of politics, and in particular worldwide protests, has been instrumental in the growth and widespread use of a whole new lexicon in our everyday lives. We see it in our newspapers, on our televisions, read it on websites and hear it on the radio – but where exactly did these ‘buzzwords’ come from and what do they really mean? The language of protest has thrown up a number of these terms that have been suddenly popularised by media use, so here at Lingua Translations we’ve taken an in-depth look at a few of them to discover their true origins and meanings. This phrase came to the fore during and following the Occupy Wall Street movement of 17 September 2011 in the New York City borough of Manhattan and its financial district, a protest which spread to other US cities and around the globe. 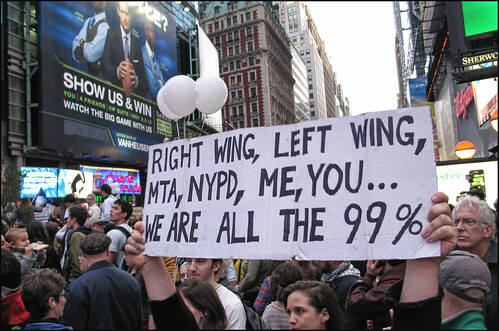 The concept of the movement’s term – seen on banners, placards and signs worldwide – is that the general public are the 99% and subsequently the vast majority who were not bailed out financially by the US government. It is, in turn, then a protest and direction of anger at the remaining 1% that were. National statistics and studies support this theory. A Congressional Budget Office (CBO) report stated: ‘…over the last quarter century the top 1% of income earners enjoyed far, far bigger real income gains than the other 99%.’ Economist Edward Wolff compiled data which led to the startling discovery that 99% hold about two-thirds of American wealth, meaning the top 1% has nearly a third. The exact origins of the term ‘The 1%’ are unknown, as it has been used in reports, forecasts and surveys for some time, but its use has certainly increased dramatically as a result of Occupy protesters and the vast media coverage these protests received. So much so, that ‘Occupy’ was the top word of 2011 in the Global Language Monitor’s annual global survey of the English language. The term ‘banker’ is one which has taken on a negative and almost derogatory connotation through stereotypical conceptions of this occupation. Bankers today have become viewed as greedy individuals with huge bonuses, who have been portrayed in a particular light in the press through widely publicised stories such as that of the London banker who spent almost £40,000 in one single evening at a lap dancing club in the capital. It is perceived that it is this knowledge of their substantial earnings and disposable income which has led to the increased level of disgust directed towards them in recent times. They appear, to many, to be chucking large amounts of their money around carelessly, whilst the majority of us receive a mere fraction of their earnings and struggle with the increased cost of living in a difficult financial climate. ‘Trust me I’m a banker’ has almost become a household phrase (replacing the innocent ‘Trust me I’m a doctor’), such has been its rise in popularity in the media and the language of protest. The term ‘fat cat’ immediately conjures up an image in one’s mind the moment we read it or hear it. Whereas some time ago people may well have simply thought of an overweight feline, the language of protest has shifted its meaning so much that we now associate it with referring to the individuals we view as being lucky, with huge wealth and who ‘have it easy’. The first use of the term appears to be in the 1920s when describing rich political donors, but of course nowadays it is commonly used to depict characters such as the ‘bankers’ and ‘top 1%’ mentioned above. READ Cultural insight: What to expect at an Asian or African wedding! At Lingua Translations, we’re passionate about language and the language of protest is just one small area that we’ll continue to look into, as it impacts upon our daily lives and often crops up without us even realising. Our translation and interpreting services cover a vast range of different languages, and we ensure that we’re always looking to increase our knowledge of the many factors which affect our use of them. What are your views on the language of protest? Can you think of any other terms which have been popularised recently? Please let us know.